Field Studies, the scientific journal of the Field Studies Council, was published between 1959 and 2003. In 2005 many of the papers were made available online. They provide a wealth of information about the areas around the FSC's Centres, and have been a well used resource. In 2015 Field Studies was re-launched as an online peer-reviewed journal. It aims to publish papers and articles that increase our knowledge and deepen our understanding of the areas around FSC Centres. 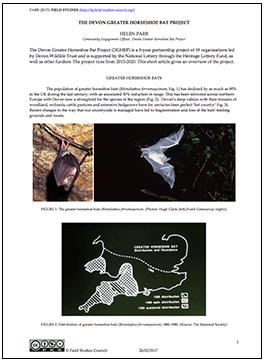 Articles may cover biological, geographical, geological, and pedagogical themes as well as descriptive natural history. Normally, material published in Field Studies will be linked directly to the work of the FSC, either through one or more of its learning locations or via its other scientific and educational activities, including environmental sustainability. However, other items will be welcomed where relevant to the broad aim of inspiring out-of-classroom learning and first-hand experience of the world around us. Further information on the scope of the journal and instructions for authors can be downloaded here. 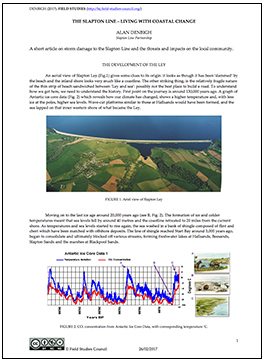 To view the Field Studies Journal papers, you will need to have Adobe Acrobat Reader installed.